Thought I would give you an update on my writing world lately. As previously mentioned, I finished the first draft of my latest work in progress about 10 days ago. I have gone through part of it, tidying up sentences and thoughts, moving around sections and even deleting and replacing parts to make sure it works. It is a gratifying process, but a scary one, because now I know that in a few days I will hand it over to a few of my friends for critiques. But even while that goes on, my mind is also kept busy plotting and planning the next projects I will work on. Story ideas are not difficult for me to come by. Every time I have one, no matter how big or small, I write it down.When I come up with more ideas later, I add it to the notes I have for it. I have imaged dozens of stories I want to write, but today I am comfortable with more than 20 of them. I have a mix of series and single titles running through my head. Most are adult, but I even have a few young adult books. They cross genres, apparently a big no-no for branding that I choose to ignore. At the pace I am going, if I continue writing one a year, I will have material until I am 50. That's if I never have another story idea again. I don't plan to keep going that slowly. I can't afford to, really. What can I do to give those ideas life sooner than later? There is no simple answer, at least not one I know. The only way to do it, is to keep writing. Keep trying. Keep creating. Take it one project at a time, without forgetting the other ideas. Those characters depend on me to have life, right? I have a clear plan for the book I will write next. 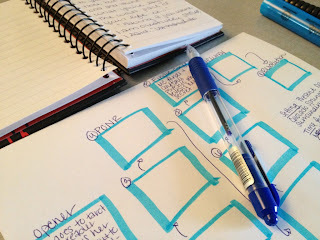 I started a new series of note cards, post-it notes and vision boards to plan the story and the characters. It is an exciting time in the process, my favorite by far. I'm using methods of discussed before by targeting the rising action and saving photos that give me a visual of my story's world. It can be challenging to find the time to do it. I work a full-time job, I have one or two books to read and review weekly (Not to mention the ones I do for fun -- I read the Hunger Games trilogy earlier this week and my mind is still blown, but that's another story). I can list other obstacles that get in the way of giving me time to work, but there is no point. I just have to make the time, right? 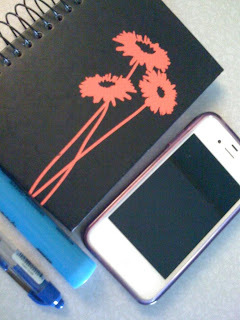 One way I like to keep my focus on my story wherever I am, is by carrying around a small notebook and pen in my purse. Combined with my iPhone, I have resources that enable me to jot down ideas as I have them. Sometimes I write a few ideas for plot lines. Other times, I might write lines of dialogue. Regardless of what I do, it keeps me thinking about my story, and I can do it whenever I have a few moments to spare. Like I said, this is an exciting time. I'm story-telling, and that's the best.